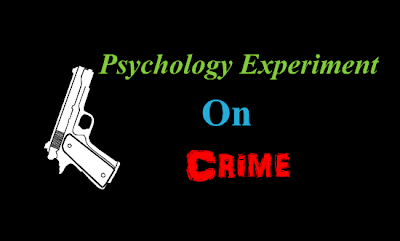 Here the psychology experiment gives the brief explanation on our human behaviour, why and what kinds of people do the crimes and in what situations they do the crime. Year 1969, Stanford University, United States of America. Profesor Phillip Zimbardo designs a psychology experiment. Almost 40 years later we know that Prof. Zimbardo is an expert in his field, an internationally known specialist, an emeritus proffesor at Stanford, former professor at Yale, New York and Columbia, former president of the American Psychological Association and author of many scientific contributions in the social psychology field. Let's go back to his experiment. What did he do in 1969? He left two cars abandoned in the street, two identical cars: same brand, same model, same color. He left one in the Bronx, a poor and controversial area in New York at the time. And the other one in Palo Alto, a rich and quiet area in California. Two identical cars abandoned, two neighborhoods with very different residents, and a team of social psychology specialists analyzing people's behavior. The car left on the Bronx was scrapped in a few hours. It lost the tires, the engine, the mirrors, the radio... everything that could be used was taken, and what was left was destroyed. The car in Palo Alto, on the other hand, kept intact: nobody touched it. -It's poverty!- a choir of voices says immediately. Because of course, it's became usual to blame poverty for every crime. And with that idea agrees, strangely or maybe not so strangely, both the hardest right and the hardest left. However, Zimbardo's experiment wasn't over yet. The car abandoned at the Bronx was destroyed. And the one at Palo Alto was in perfect condition after a week. So the investigators did one thing. Just one. They broke a window of the car in Palo Alto. The result? The same thing that happened at the Bronx happened now in Palo Alto. The stealing, the violence, the vandalism, left the vehicle like the one in the Bronx. In a few hours and with the same fury. So? Why a broken window in a safe neighborhood can set off this criminal process? So it's not about poverty anymore. Now there's evidence that it's something else, something related to human psichology, with how people relate to each other, and how communities and individuals interact. A broken window in an abandoned car is a big message. A message that talks about deterioration, lack of interest, of concern, about the break of certain rules of behavior. A message that many decode as the absence of law, of rules, of regulations. Like anything goes. Each new attack to the car reaffirms that message. And the broken window ends in the most irrational violence. The fuse lighted by Zimbardo in 1969 is still burning. One of the most interesting later developments is the result of the work of Prof. James Q. Wilson and Prof. George Kelling. 1. That crime is worse in areas where negligence, dirt and mistreat are usually found. 2. That if you break a window in a building and nobody repairs it, soon all the other windows will be broken too. 3. That if a community shows signs of deterioration and no one seems to care, then that's where crime will grow. 4. That if 'little' crimes are commited and are not punished, then bigger and bigger crimes wil happen. 5. That deteriorated public spaces are progressively abandoned by most people (that nervous and scared just go home) and those same spaces are occupied by delinquents. The broken windows theory was applied for the first time in mid 80's in the New York Metro, where George Kelling had been hired as a consultant. The result was extraordinarily encouraging. Starting with small things, soon the Metro was a safe place. Later, in 1994, Rudolph Giuliani was elected Mayor of New York and named William Bratton New York City Police Commissioner. And who was him? He was in charge of the Metro Police while Kelling was a consultant. What did he do? Based on the broken windows theory and his experience at the Metro, he encouraged the Zero Tolerance policy against crime. The key to this strategy was to create clean and well cared communities, not allowing any kind of crime. The practical result was a huge fall in all crime rates in New York. Some people hear the expression 'zero tolerance' and wrongly believe it's some kind of authoritarian and repressive solution. Actually, it's the exact opposite, it's more about prevention and promotion of good security conditions. It's not about a primitive horde lynching the criminal, and it's not about police abuse of authority. It even has zero tolerance about that. It's not about the death penalty or lowering the age for legal responsability. And it's also not about some recipes created for some other reality, it's a group of ideas that with different names and applications can benefit different societies. This is not a minor fact: it's not zero tolerance against the actual person that commits the crime, it's zero tolerance against the crime itself. And that's a big difference. What it's actually about is building (or rebuilding) clean and organized communities that respect the law and the basic code of social and human coexistence.